One of a kind Fancy Design, with Secure Solid Hinges, Sleek and Stunning, measuring 22mm. 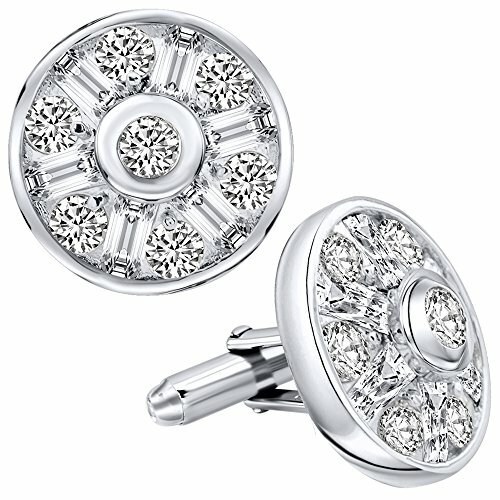 With 26 Cubic Zirconia (CZ) Stones, Platinum Plated, polished rhodium plated Cufflinks, Weight is Approx 21.8 grams. CARING FOR STERLING SILVER As with all sterling silver, never use anything but a clean 100% cotton or a special sterling silver cleaning cloth. Paper, polyester, and coarse fabrics often contain wood fibers or synthetics that can cause tiny scratches in the surface of your fine sterling silver jewelry. Remember, silver is a very soft metal and you can scratch it if you aren't careful so don't rub it too briskly. Silver should not come into contact with harsh household chemicals such as bleach, ammonia, or chlorine. To avoid silver from tarnishing, store silver jewelry in a velvet lined jewelry box or pouch, as it is prone to tarnish as it naturally reacts with sulfur or hydrogen sulfide in the air. CARING FOR RHODIUM PLATED (PLATINUM PLATED), GOLD PLATED, ROSE GOLD PLATED OR BLACK RHODIUM PLATED SILVER As with all plated items, it is extremely important to keep them away from any kind of chemical. Do not clean in them in the dishwasher or use ultrasonic cleaners that utilize chemicals. Never use toothpaste and never brush with a toothbrush. Do not use polishing cloths that are intended for use on uncoated silver or for gold jewelry, and ensure pieces are not in regular contact with hard surfaces. Avoid contact with perfume, hairspray, body lotion, body wash, soap, and household cleaning products. Clean plated silver with warm water and a mild liquid soap. Rinse thoroughly and dry with a soft polishing cloth immediately to avoid mineral residue from the water. Do not swim in the ocean with plated jewelry. Plating may wear off over time. Re-plating jewelry does not take long, and most professional jewelers offer this service. Keep plated jewelry in a velvet-lined jewelry box, or wrap it in a soft material that will prevent scratches.